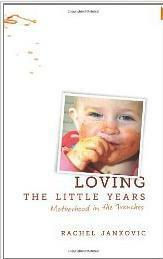 I had noticed this title - Loving the Little Years: Motherhood in the Trenches - coming down the pike from Canon Press. When I was asked if I would like to read a copy of it, you can bet I accepted post haste. Turns out the book couldn't have come at a better time! Rachel and her husband, Luke, have five children under the age of five. Exact ages at the time of printing: 5, 4, 2 & 2 (twins, of course!) and 5 months. To say she's just a wee bit busy and periodically overwhelmed is a bit of an understatement. She does, however, make a point not to use the word 'overwhelmed' least she start believing it to be true, crippling her from the ability to lead a productive life. But what is a productive life, exactly, when you have little ones running about? I'd like to know that myself. I'm sure some of you ask yourself the same question. The crux of Rachel's answer here would be that productivity IS serving the needs of your children and sacrificing what you think needs to be done, for what wants to be done right in front of you. In other words, when your children are little - your life is all about them. What you think might not have long term benefits (i.e., stopping everything to play a game of hide-n-seek) beats out cleaning the kitchen floor. As she reminds mothers, you won't remember or care much about how clean each room in your house might have been, but you will remember the joy and good times you experience with your children. Mostly, I found this book to be encouraging. If a woman with five under five can find reasons to smile about life, surely this woman with two toddlers and a baby on the way can manage to get through a few days herself. More than just offering encouragement though, Rachel offers a bit of caution or, if you will, admonition to her reader that the parent needs to make sure that their heart attitude is correct before they go about correcting the behaviors of their progeny. She gives a few examples of times when situations come up that would (naturally) cause a mother to start stressing. Instead of coming down on the children for the chaos which they are unintentionally creating, Rachel urges the parent to examine their own heart. If we as parents interject our own sin into the equation, it's not likely that the situation with the children will improve or smooth out into a grace-filled learning experience. Because of her emphasis on the heart attitude of the parent, Jankovic earned the endorsement of Tedd Tripp and R.C. Sproul, Jr. for Loving the Little Years : Motherhood in the Trenches. She earns mine as well (although that's probably not as big of a deal) for her forthrightness and honesty in addressing the everyday cares, concerns and stresses which mothers experience and deal with on a constant basis. She speaks with grace, encouragement and good humor, allowing the reader to see their flaws without feeling condemned for wanting to run away from home and hide out until chocolate and caffeine have been consumed and bedtimes have been observed. No, life with little ones is not easy. As the back cover of this book suggests, Rachel did not write this book because 'mothering is easy' for her. She wrote it because it isn't. This I know full well. It was nice to hear someone else say so. Thank you, Canon Press, for sending a copy of this my way. I needed it. This sounds exactly like what I need right now! Wish this had been around when mine were little! That was something I had to often remind myself of, that my children were my main ministry. i recently read this, and was also struck by the immediateness of the stories. I'm ordering more for a bunch of moms of little people who i know. i do hope she edits it, tho. Some sections really did not flow well. Yet ANOTHER book to add to my list! After my post about winter blues and feeling overwhelmed on Friday I DEFINITELY need this book!! I only had 4 kids in 5 years but I think I can relate to what she's saying. ;D HAHA SMB! Well, thanks. And I do think you would really get something out of this book. I thought of you a lot when reading it! I think you would absolutely identify! Thanks for directing me to your own review. This (setting aside my to-do list) is a daily struggle for me, but Rachel's words keep bouncing around in my brain.